Snakeskin, sportswear and an honorary track team. In an era where sportswear has become somewhat of a buzzword in fashion, Virgil Abloh is paying timely homage to the true ethos of the trend, as well as its original superstars. Featuring 8 distinguished athletes alongside models including Bella Hadid and Kaia Gerber, Off-White SS19 epitomised authentic sports luxe. Logo-adorned lycra was paired with voluminous skirts and dainty blouses, accessorised with a range of angular shades and mini backpacks. The collection also plugged on-trend lurid neon, from snakeskin trenchcoats, bum bags and biker gloves, to slogan pieces and runner vests. And of course, the show was highlighted with a heavy dose of Nike. Following Abloh’s iconic collaborations with the brand – 2017’s rework of “The Ten” classic styles (as seen on pretty much everyone who’s anyone on Insta), and this year’s Off-White x Serena Williams x Nike Air Max 97 “QUEEN” shoe – the designer incorporated Nike logo details, as well as his own sneaker adaptions. Inclusive, innovative, and highly wearable – Abloh’s reign is still well underway. Swimsuits, snakeskin and Eiffel Tower infinity pools brought the glamour for Saint Laurent SS19. 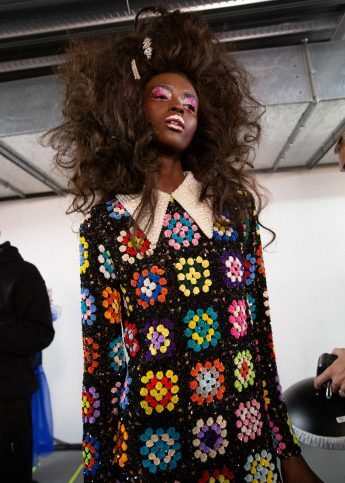 "User may experience feelings of euphoria.” Sequin-mania at Ashish AW19 for LFW.